Most of our arcade machines come with all the classic games like Pac Man, Space Invaders, Asteroids, Galaxian, Phoenix, Galaga, Streetfighter and many many more..too many to mention!! Be the envy of all your friends and set up your own arcade room at home with our fun, ergonomically designed arcade machines. You could of course enjoy playing the games yourself but our machines are sure to impress all of your friends and family and are irresistibly enjoyable for guests of all ages. 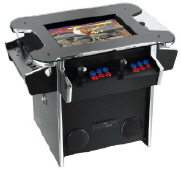 We offer both table and machine style arcade machines so you’re able to find a unit that fits into a space of any specification. The capacity of the machines ranges from 60 games to over 350 games and generally includes much-loved games as Space Invaders, Street Fighter and Pac Man. We can guarantee people of all ages will love these timeless classics and we offer a machine selection wide enough to fit anyone's budget. 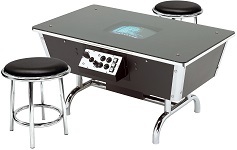 Browse our latest collection of multimedia arcade machines, many of which can be connected to the internet for a cutting edge arcade experience. 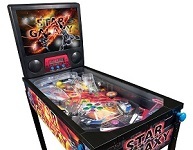 Splashing out on your own personal games room at home guarantees years of pleasure playing these fun and funky games in the comfort of your own home.